I've mentioned the Littlest Squid before: the genus Idiosepius, which contains only a handful of very small, very adorable species. And I commented that they have this habit of gluing themselves to seaweed, to hide from predators. Well, today I'm here to explain how they do it, because a new paper just came out on the topic of itty-bitty squids and their glue organs. Mmm, mechanical adhesion . . .
What's not nearly as common among cephalopods is chemical adhesion--glue. Some nautiluses and cuttlefish are thought to have it, and, of course, our little pal Idiosepius. But how exactly it works has been largely mysterious, so Norbert Cyran and a couple of his colleagues in Vienna decided to take a look. A very close look indeed! This is one of many images in from Cyran's paper, illustrating the microscopic structure of the glue organ. They peered right down into the squid's skin, identifying all the cell types they found and the likely role each one plays in the process of adhesion. They found two different types of secretory cell (if "secretory cell" sounds boring, think of them as "oozers") and concluded that the glue organ of sweet little Idiosepius produces two different secretions (oozes). Option one: it's a duo-gland system, in which one secretion (ooze) does the sticking, and the other does the un-sticking. 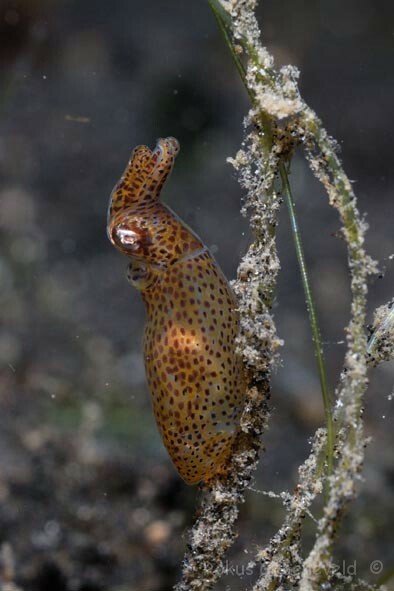 This curious style of adhesion, while unusual, is well-known in flatworms and a handful of other organisms. But it's not for the impatient gluer. If you've ever tried to dissolve the label off a jar, you know that the process of dissolution can take a frustratingly long time. Or, option two: it's epoxy, two secretions (oozes) that have to be mixed together before they'll act as glue. Cyran et al. think this is the more likely possibility, because there's some evidence of the two cell types oozing at the same time. Also, neither ooze contains any acid, like you'd expect to see in the dissolving ooze of a proper duo-gland. Finally, they claim, these "highly agile animals with rapid response behavior" would never stand for waiting around to dissolve themselves off a blade of grass, when they have the strength to simply pull themselves free. I'm adorable and sticky, and I've got places to be.